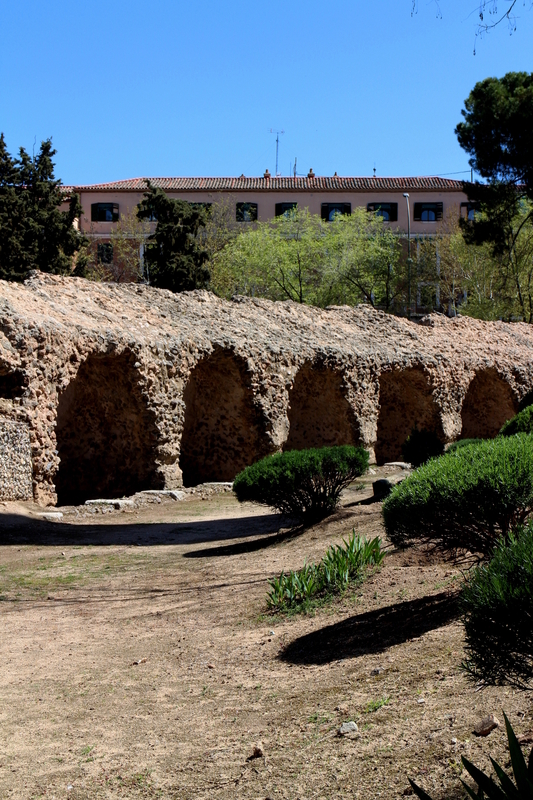 Less than an hour from the Spanish capital, Madrid, there’s fortified town crying out to be explored. With winding cobbled streets, majestic churches, rugged countryside and authentic tapas, Toledo is perfect for an overnight stay. My travel guide to Toledo will show you what to see and do, and most importantly, where to eat. Spring has well and truely sprung this week in southern England. I love this time of year. Warmer days, brisk April showers, longer evenings, trees bursting forth into leaf and blossom dusting the pavements of my hometown. It’s a beauty to watch the transformation a little sunlight and warmth can bring. Last year, Easter fell this week and we headed south to Spain for a few days. The magnolias were in bloom, the trees lush with fresh new foliage and skies blue. It was the perfect antidote to the grey winter months we were only just leaving behind. We spent a couple of nights in Madrid (you can read about our adventures in Eating your way around Madrid: One tapas at a time) before jumping on the train to medieval Toledo for our last two days. Baking in the spring sunshine beside the river and within the old stone walls, Toledo seemed glorious. Although we only spent twenty four hours in this little slice of Spanish history, I couldn’t have been happier that I picked this location for our last night. So, if you’re looking for some spring delight, you’ve found it here. 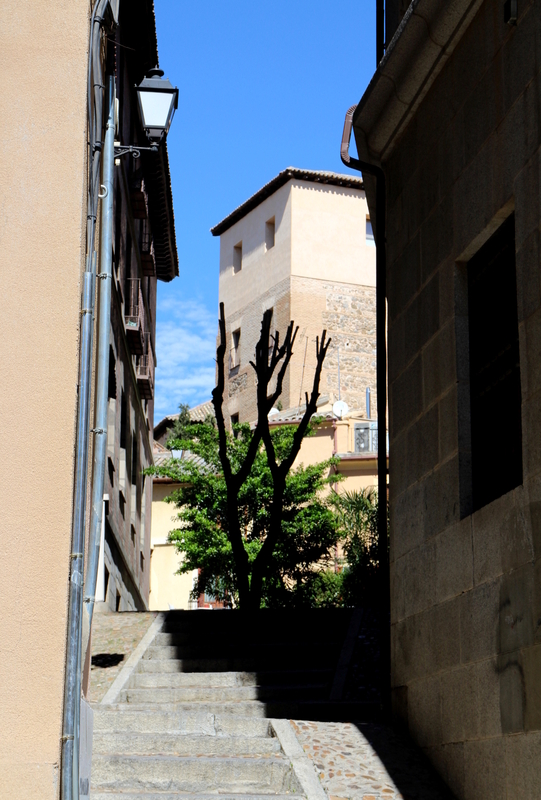 It’s my guide to exploring the fortified town of Toledo, Spain. Toledo is an ancient yet lively walled town situated in the region of Castilla-La Mancha in central Spain. It’s only half an hour from central Madrid by train, making it the perfect addition to a trip to the Spanish capital. The station alone makes quite the architectural statement, with nods to the some the Moorish style buildings you’ll find within the town. But, situated a little way from both the newer town and historic walled centre, it feels quite an innocuous arrival. Follow the signs from the station and you’ll be wondering what the fuss is all about. There’s a main road and some modern buildings in the distance, but nothing to write home about. Suddenly the road bears round to the left and the old town, in all it’s glory, appears in front of you perched above the river on a rocky outcrop. Getting into the old town means crossing an ancient fortified bridge, then trekking up a couple of narrow, stone walled alleys. There are easier ways to do it (look out for the extraordinary escalators criss-crossing the outer walls in places), but they’re not quite as fun. Eventually you’ll arrive in the centre of town, in the Plaza de Zocodover. At this point in your journey, you’ll have to accept that Toledo – even out of season – is a pretty popular tourist destination. Like us, lots of visitors to nearby Madrid head here for the day. We arrived at midday and were slightly dismayed to find that the square was packed full of school kids and chain restaurants that contradicted the fabulous entrance we’d experienced. But don’t let this put you off. There’s bucketloads to do in Toledo, and it’s easy to escape the crowds when you know the right time of day to seek out the best things to do here. My secret to falling in love with Toledo? Stay for the night! As the sun goes down, the crowds melt away and a new-old city emerges – atmospheric, alive with locals and full of quiet corners to enjoy a few drinks and tapas. Head outside the city walls when the streets are packed, because you’d be mad to miss out on some the city’s treasures beyond its walls. 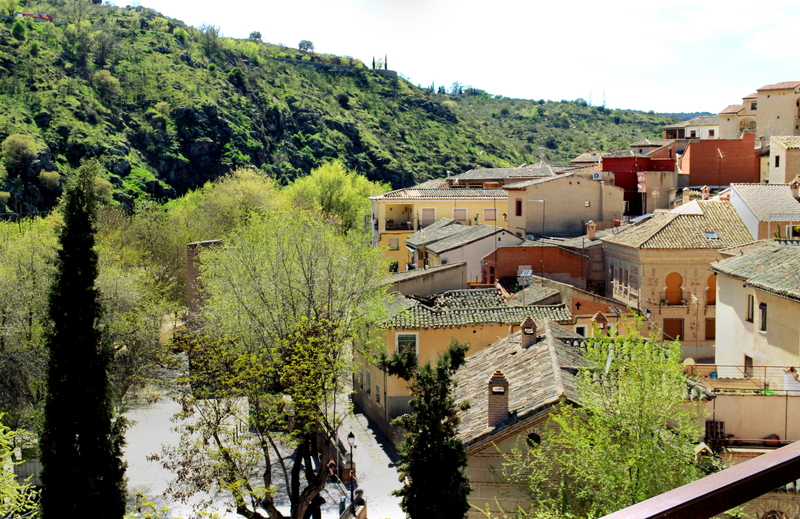 From the Puente de Alcantara you can get down onto a waterside path that tracks around the old town. Follow it along the river and you’ll get a different perspective on the town – theres views you just won’t find by road, and stumble across unexpected picnic spots and pretty houses aplenty. 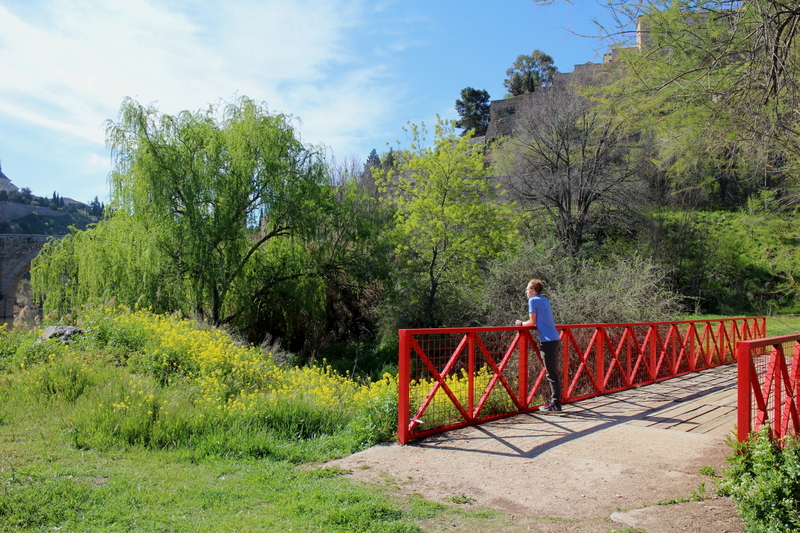 Next, follow the path to the Puente de San Martin (a bridge that’s worth a visit in it’s own right for it’s panoramic views) and cross over, away from the old town. Take a left turn and head up the hill for a couple hundred metres. On your left you’ll see a signpost and path leading to the chapel of La Cabeza. 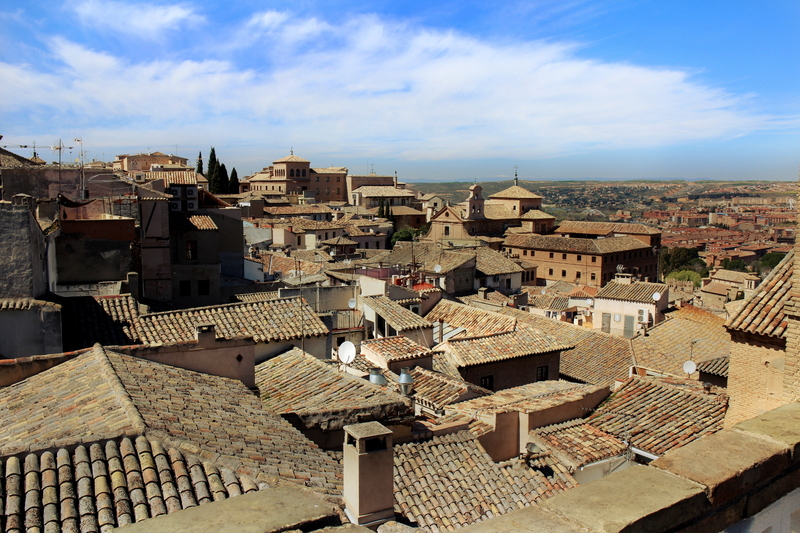 From here, you can look down on old Toledo from a completely different angle. It’s a great way to get a feel for where the largest, monumental buildings sit within the walls. Toledo began life as an Roman trading town, with strategic importance at the centre of the Iberian peninsula. It was a focal point for the many farming communities that surrounded it, and sported as it’s pièce-de-resistance a phenomenal arena or ‘circus’ that hosted sporting events and markets with crowds tens of thousands strong. Incredibly, substantial parts of this vast structure still remain, peppering a little park that’s sandwiched between the new and old town. They give clues to the vastness of the arena – as well as it’s impregnable construction. The early evening is the perfect time to stroll the cities meandering streets. Pop your head inside cavernous churches, soak up the sun with a beer or two in a streetside cafe, and seek out hidden squares and courtyards tucked away within the old city walls. 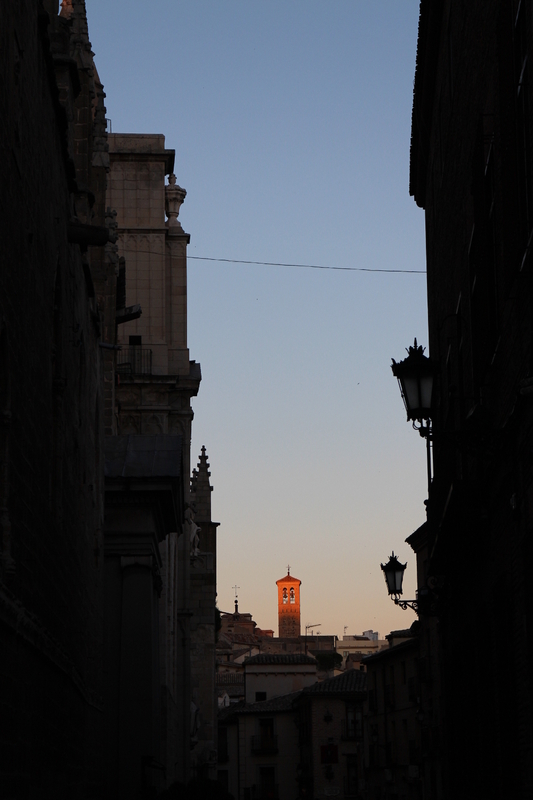 Now is the best time to take in the monumental buildings of Toledo – the Alcazar, the Cathedral, the many churches – like the locals do, on an evening stroll. And with gift shops and tourist cafes shuttered up for the day, look out for signs of life that have remained unchanged for decades, even centuries. Hand-painted signs on the walls of town houses hint at the traditional industries and trades that have contributed to Toledo’s wealth and success over the years. Pretty little trees in blossom told us summer was on its way. This little Spanish city is especially magical first thing in the morning when the streets are quiet. 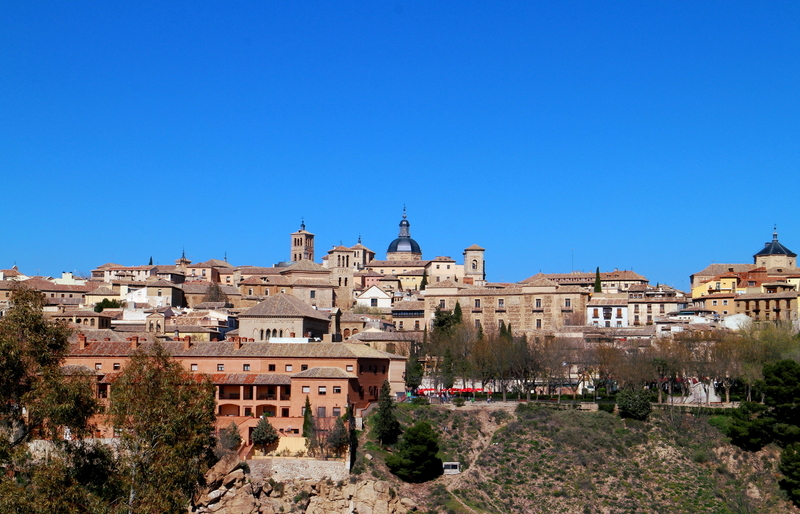 The sun gives Toledo and the surrounding hillsides and plains a glow you won’t see once it’s fully risen. Get up early and circumnavigate the city walls at first light, and enjoy the fresh air by the river. It’s a wonderful place to run, if that’s your thing. Or enjoy breakfast whilst watching the world go by from an old-fashioned cafe. Toledo is a curious place. As it metamorphoses from day to night, the somewhat generic restaurants and eateries packed into the main square largely disappear. It makes finding food more of a challenge, but I like a challenge. Fortunately, Toledo doesn’t fall short and there’s plenty to find if you’re willing to explore. If cooking is your thing, head straight to Calle Coliseo (better earlier in the day than later) to scout out the traditional market that’s home to butchers, grocers, pescaterias and a handy supermarket. You won’t find better for authentic ingredients in town, and it makes a good stop if you want to grab a few indulgent essentials for a picnic lunch or breakfast. If you’re hoping for someone else to do the hard work in the kitchen, make like a local and head to the Mercado de San Augustin just off Calle Silleria. More of a streetfood market, this recently renovated building is home to a handful of bars and restaurants across three floors offering up tapas, drinks and more on an evening. We found it packed with students (Toledo has a university campus nearby, and students are usually a good sign of fun and inexpensive food) forming a great long queue at Show Burguer. Not wanting to miss out, we joined the queue and tucked into gourmet burgers topped with local specialities. As the night was still young, we meandered our way through the warm streets looking for somewhere to quench our thirst. We happily stumbled across La Maquerida de la Trinidad on the corner of Calle Trinidad. Charmed by the looks of it’s cosy interior, we retreated inside to enjoy a few beers and some of the most delicious complementary tapas I’ve ever enjoyed. Just don’t tell the owner we’d already eaten – we were enjoying woofing down delicious mouthfuls of homemade tortilla and little pinxos. Lastly, if there is one meal I love most in Spain, it’s breakfast. 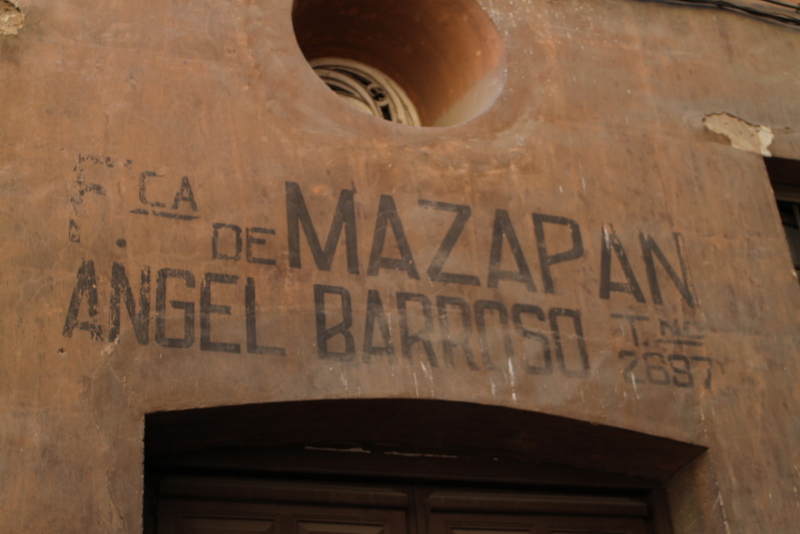 We popped to the charming La Papa next door to our hostel to fill our boots. The very reasonably priced €3.50 ‘energetica’ breakfast left me comfortably full of pan con tomate, tostada and tortilla . Plus, their cafe con leche tasted as good as any I’d savoured in Madrid’s more upmarket coffee shops. I can’t recommend the hostel where we stayed in Toledo enough. Even if you think a hostels not for you, think twice before you decide this gem isn’t for you! The Oasis Hostel Toledo was simple but perfect. The central location is fabulous, and our room was comfortable, beautifully presented and had two rather romantic french doors looking out onto the sleepy street below. Oh, and the best bit? This view from the roof terrace. A private room with en-suite came in at just under €50 per night (for two guests) in April. The stunning views? Priceless. Toledo is worth a day of any traveller’s time, with it’s wealth of history, charming streets, sleepy cafes and panoramic views. But to see the real Toledo, you’ll need to time your trip right. Soak up the morning sun as the city slowly comes to life. Sip a cold beer and nibble tapas outside a cafe as the sun sinks golden below the spires and rooftops of this ancient town. And step beyond the streets well-trodden to see signs of centuries of life in this atmospheric little place you’ll be glad you discovered. Have you visited Toledo? What hidden gems did you stumble across? We flew to Madrid in April 2016 with Easyjet and travelled to Toledo by train with Renfe, the Spanish rail network, from Madrid’s Atocha Station. A return ticket cost €20.60. Our bed for the night was at the beautiful Oasis Hostal Toledo, one of the most recommendable hostels I’ve ever had the pleasure of staying in.